AN ELECTRONIC device which uses oscillating radio tubes and transforms the resultant howls into music, has created a great deal of interest in London, where the first phonographic recording of such music was recently made. A steel rod, about one and one half feet high, is connected to a special electronic device. The operator stands before this rod and by waving his hand at different distances varies the electrical capacity between his body and the radio tube grids. The resultant music is something like that produced on a musical saw. It is attracting considerable attention abroad. It’s a “robot orchestra”?? Yeah, right. Yes, that\’s definitely a theremin. The guy in the photo might be Leon Theremin himself, but it\’s hard to say for sure given the angle. That’s not a robot orchestra. This is a robot orchestra! 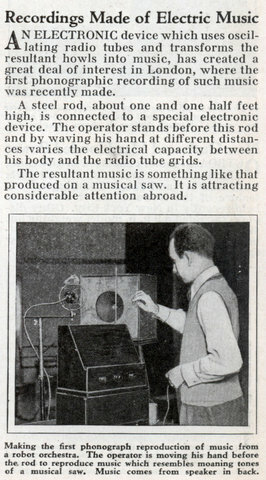 It is, indeed, an early theremin; however, later theremins tended to have two antennae, one for pitch and one for volume. This one appears to have a single antenna. I’ve always wanted to build one of those. Debate rages about which type of theremin is better, analog or digital. Personally I love them all. It’s a shame they don’t get the same attention in movies that they used to. There’s nothing spookier in a sci-fi or horror flick. I’m almost positive that’s Leon Theremin. 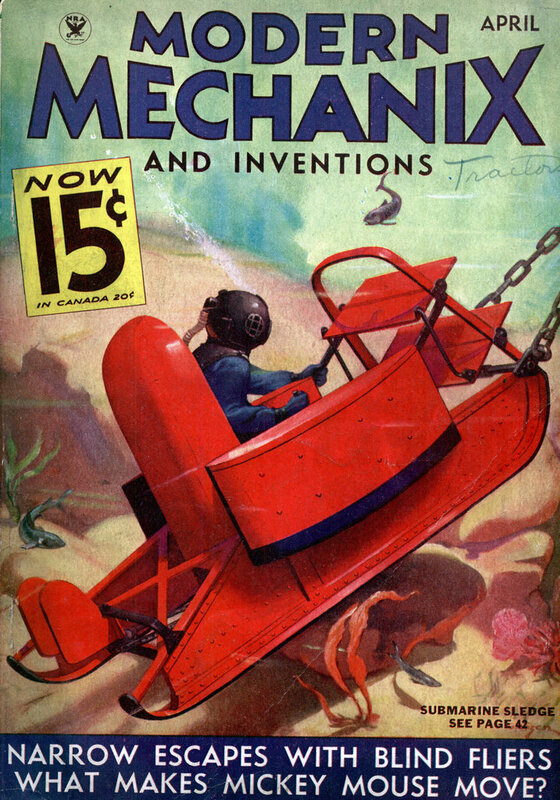 Modern Mechanix Magazine was just a bit late with this story, since the theremin was invented over a decade earlier.